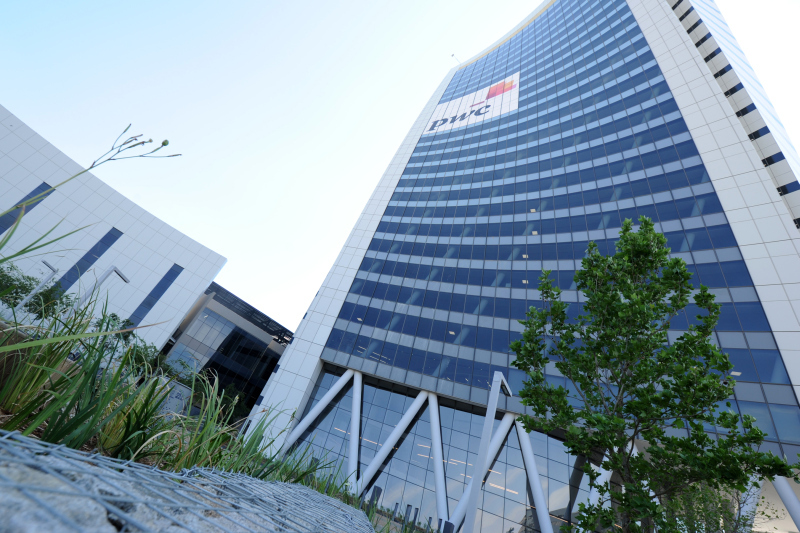 The iconic, 26-storey PwC Tower in Waterfall City, Midrand, stands tall on a high point between Johannesburg and Pretoria. The twist design is eye-catching and took some clever modelling to get it just right. 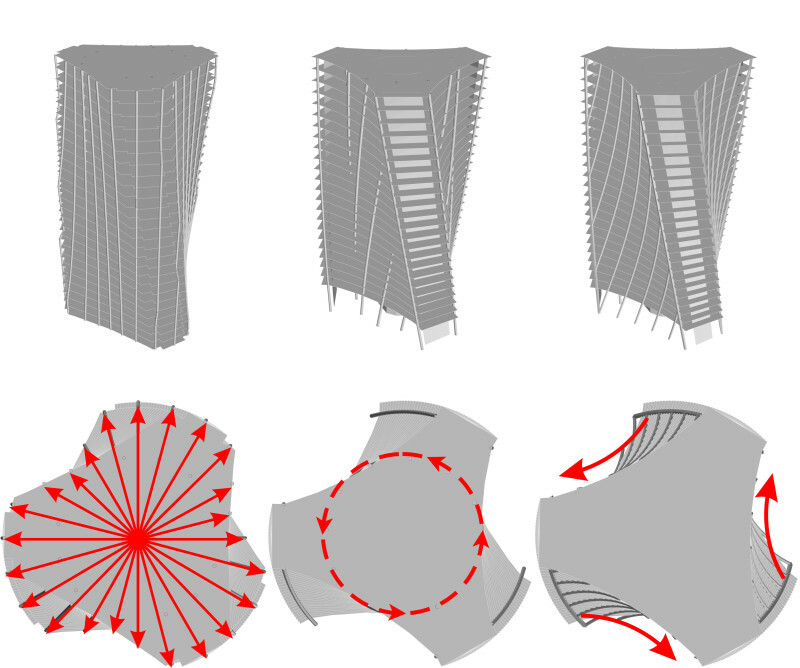 First of all, the shape of the spiralling tower causes torsion on the core of the building, significantly affecting the structural design of the tower. Second, the warped, concave glass façade could possibly cause concentrated solar reflections, which also had to be calculated and addressed. WALLS & ROOFS spoke to Rudolf le Roux, façade engineer at Arup, to find out what role parametric modelling played in the design and realisation of the unique shape and façade of the PwC building. When looking at the building from above, it has a structural, reinforced concrete core that houses the lifts, bathrooms and other services. 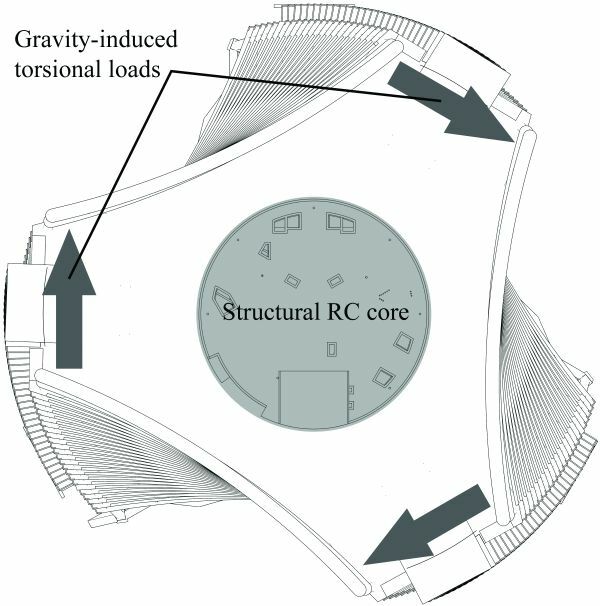 The building’s spiralling shape around the core is created by each floor rotating 1.2 degrees. The three corners of the floor plate essentially form three towers leaning in a clockwise direction around the core. To withstand the torsional load on the building, the team thought about positioning all the columns so that the lateral force component of each column goes through the middle of the building, thus eliminating all torsion, but this solution had an aesthetic downside in that the spiralling form of the tower was lost. A second option was to create a spiral of columns on the inside of the building to counter the torsion; however, this would have resulted in too many columns disturbing the floor plans. The final concept was to move the spiral of columns to the façade where they wouldn’t interfere with the floor plan, and orientated them counter-clockwise. “We then knew that we had a solution, but we still didn’t know the final slope of the columns that would adequately balance the torsion on the building,” says le Roux. Using Rhino, a 3D CAD program, together with Grasshopper, a graphical algorithm editor, le Roux created a flexible, dynamic model of the building. Instead of changing the parameters manually in a static design, Grasshopper allows one to introduce various vectors to rotate shapes, change angles and rationalise designs. “We utilise parametric modelling to define the shapes of the architect’s design right through to fabrication,” le Roux states. “In this case, we used two parameters to determine the slopes of the columns: the number of columns and the height of each column set (the number of floors they span) as they lean to the one side until they node out. Because of the building’s concave shape, each column has its own slope, but once you have one set of columns, the same set is repeated up the height of the building,” he explains. In the parametric model, the floors are then meshed – essentially broken up into triangles – and then exported to structural analysis software, called Oasys GSA. This program determined the column loads, the resulting rotation and essentially also the countering torsion that is generated through these columns. “Obviously you can do this modelling manually, drawing the columns one by one, and redo the process if you want to investigate the effect of changing a parameter, but it would take some time. It is much easier to set up one model with variable parameters,” le Roux points out. To fit the glass façade to the building, all the brackets were carefully positioned early on in the model. The benefit of the 3D CAD model is that once one floor was solved, it could be repeated all the way up. Fitting the glass was another challenge. “Because of the warp, the primary aluminium frame is also warped – like a rectangle of which the one corner is lifted up. When fitting flat glass onto it, the glass is close to two of the corners, but further away from the other two. Therefore, we made an adapter piece to be able to fit the flat glass,” says le Roux. The Walkie Talkie building in London has been blamed for reflecting light and melting parts of a car parked in a nearby street. Another building by the same architect, the Vdara Hotel in Las Vegas, has been criticised for directing concentrated sunbeams onto the swimming pool deck. Also, the glass panels on the Disney Concert Hall in Los Angeles had to be treated after the fact so as not to reflect concentrated sun. 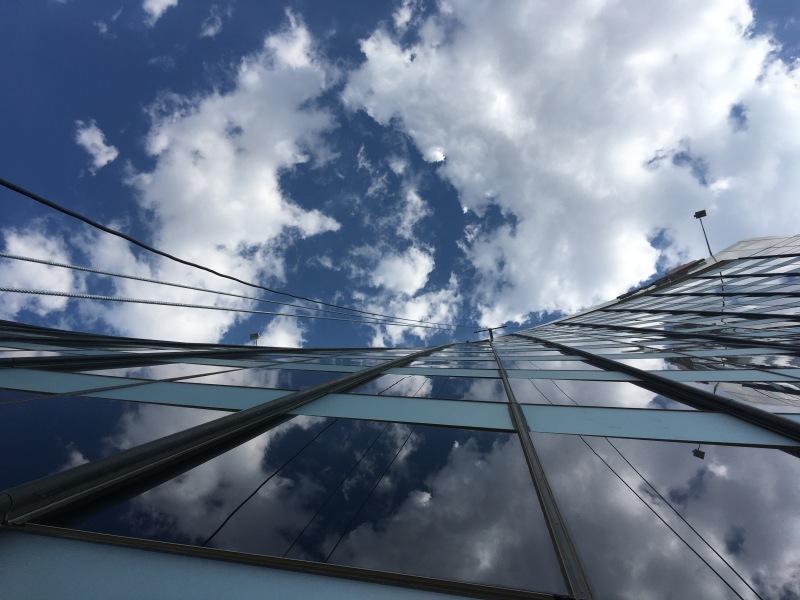 Considering these examples and other concave buildings around the world, and the warped combination of the façade shape of the PwC building, the angles of the solar reflection were worth investigating. 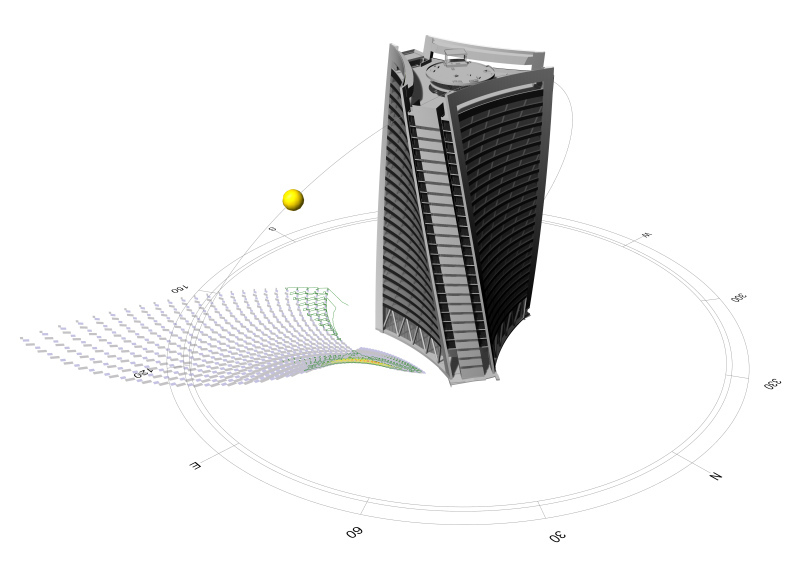 Le Roux points out that since the whole building was already modelled in Rhino and Grasshopper, he simply developed a script to calculate the combined solar reflections. “Essentially, we considered the direct solar radiation that is measured in W/m² coming from the sun, taking into account the angles and glass material, then added up the concentrations on ground-floor level. I then drew contours based on those values,” he explains. In order to get the sun position at different times of the day, le Roux used another plug-in into Grasshopper, called Ladybug. “We found that there were concentrations on all three sides of the building, in some places going up to about 6kW/m², which is about six times what we normally get from the sun,” he says. He mapped back the concentrations to the three façades to see if there was a specific problem area, but there wasn’t. “We thought about randomising the glass panel orientation, which wasn’t realistic. We also considered different glass types and found that some could be effective in winter, but in summer, due to the angle of the sun, one gets similar results, no matter the type of glass,” le Roux explains. In the end, AGC Stopray Titanium 37T vision glass was selected. “We ultimately decided to make the spandrels acid-etched glass with the acid etching on the outside so that they are non-reflective. In doing this, about a third of the reflective area on the glass was eliminated,” he states. The team accepted 2kW/m² as a tolerable limit since one gets about 1kW/m² from the sun, and when the sun is hitting flat, vertical façades in mid-summer at close to a 90° angle, one gets almost a 100% reflection, which has never been a cause for concern. Le Roux further highlights that the calculations were quite approximate and theoretical because ultimately, glass isn’t perfectly flat and the rays will typically disperse somewhat before hitting the ground. However, in areas where the theoretical concentration slightly exceeds 2kW/m², the agreed solution was that it would be dealt with in the landscaping. Full thanks and acknowledgement are given to Arup for the information given to write this article. 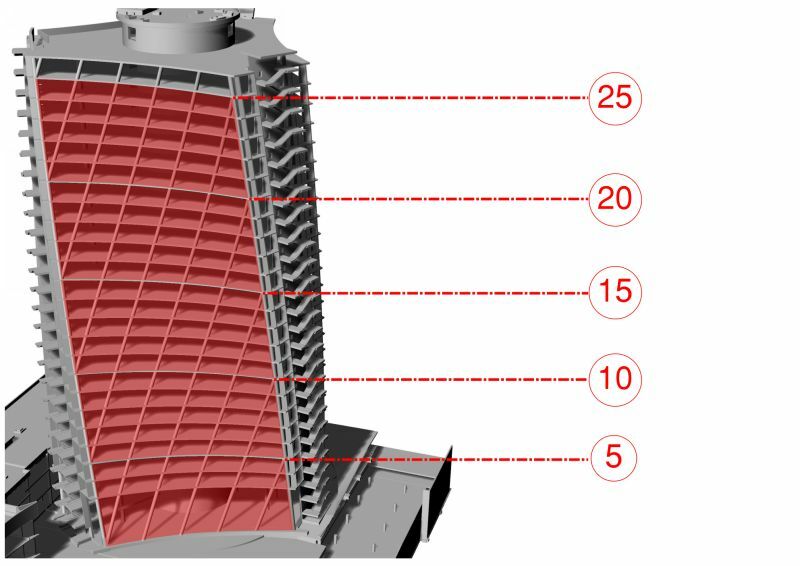 The PwC building’s twisting tower façade were modelled meticulously with the help of advanced software.